The latest round of ineptitude on the part of the Greater Boise Auditorium District should be the last straw. It is time to dissolve G-BAD. The board recently voted 4-1 to engage in some wild plan of “creative financing” to fund the convention center voters have turned down twice and a local developer declined to pursue. Now they want to build it piece meal over the next 11 years and raise the room tax by a per centage point and pray for more visitors, lower gas prices and cheap airfares. Right! –Center On The Grove was built by a private non-profit front organization in order to avoid a vote of the people…Boise Convention Center INCORPORATED. –They used public money to advertise and solicit support for a bond measure, got sued and lost when the Idaho Supreme Court ultimately ruled they broke the law. –They sold public land for those skinny Aspen condos on Front Street without a hearing, advertising, or bids. A sweet insider deal that no regulatory agency has investigated. Cities, counties, and the state all have to follow specific procedures to dispose of public land. –And this latest debacle is frought with pitfalls. Without a bond election and a clear mandate from the citizens, there is no proper method for this board to obligate a future board to do what these guys want done. Won’t work, bad idea. They are clearly trying to avoid the voters by “pay as you go” financing. Sounds good on the surface, but we could have another downtown hole in the ground if the next group elected to G-BAD decides to do something else. G-BAD is an elected government agency and needs to respond to the VOTERS, not a select few hotels and restaurants. Notice that no PRIVATE groups or individuals are willing to risk building a convention center. The GUARDIAN is in Ohio at this writing and observed that places like Toledo, Cleveland, and Columbus have nice directional signs for visitors. 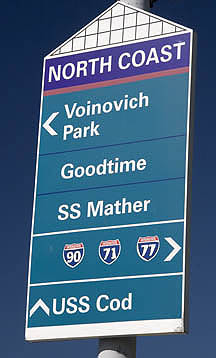 The signs are strictly for visitors and list various attractions…apart from highway directions. In Boise we should have signs all over town with directional arrows for BSU, OLD PEN, ZOO, HISTORICAL MUSEUM, QWEST ARENA, AIRPORT, EXPO IDAHO, etc. Placed at major intersections, these signs are a godsend for travelers. When Boise cannot even keep the Depot open for tourists or provide good signage, the best convention center on earth is useless. We say disband G-BAD and put the money toward promoting Boise tourism, adding signs, and keeping the Depot open. Ohio??? You have my sympathy. But, I’m glad to see you’re keeping an eye on Boise shennagins even from your flatland exile. When I saw the story in The Statesman, my reaction was, “Oh, no, here we go again.” Can’t any of these elected officials get it through their thick heads that they work for the people? I guess they think the people are too stupid to make decisions. Oh, wait — I guess they’re right. The people did elect the arrogant, evasive underhanded councilors, commissioners, etc. Let’s eliminate G-BAD, ACHD, and any other extraneous waste-our-money agencies, boards etc. that try to bypass the people who own the property they manage. Unfortunarely, we can’t abolish city councils, county commissions, state legislatures and the U.S. Congress, but there must be some way we can pull the reins and whack ’em upside the head with a 2X4 to get their attention. I’m so damned fed up with all of them that I wish we could have one single recall election to get rid of every member of such groups all with one vote, then eliminate all the unnecessary agencies, etc., and start over. There have been a number of businesses over the years that acted the same way — ignoring their customers’ desires. They are all out of business now. How can we put these rip-off artists out of business? P.S. Butch Otter just put himself in the same category by ducking out of public events in Canyon County, Gem County and on Idaho Public Television. Says he’s just “too busy” to bother with appearing before his constituents. I’ve always kind of liked Butch, and I was proud of him when he voted against the horribly written and clearly un-American anti-Patriot Act, but now he’s become just as arrogant and unresponsive as the rest of those clowns. I agree that public agencies should stick to the law regarding spending of public money. However, some ineptitude regarding this issue can also be attributed to the voters. Voters who allowed themselves to be misled by the Ameritel backed campaign of disinformation and fearmongering that your taxes are gonna go up, your taxes are gonna go up, the sky is falling, the sky is falling. Much is made of that infamous hole-in-the-ground, but nobody complains about the dusty goat-head infested dirt lots at the west end of Front ST. I would like to see more oversight (of current spending) and less chicken little-ing. I wonder how all the hotel owners OUTSIDE the downtown feel about GBAD playing with their hotel tax money? Once again it is “all about the money”!! It is time to desolve GBAD or at least reduce their access to hotel tax money! Good points one and all. Thanks for providing some balance to the Statesman article. I very much like the point about signage. God Forbid we try and better the city we live in. I sometimes think that a lot of you would just like to build a fence around the city and not let anyone in. I think one of the first things they teach you in business classes is sometimes you have to spend money to make money, oh wait that’s right, we want things like they were back in the early 70’s when there was nothing going on in downtown. I think the saying “Wilt up and die” should be your motto! EDITOR NOTE–You need to HAVE money in order to SPEND money. Otherwise you end up like ALBERTSON, ENRON, M-K, QWEST, etc. What you got against good signage, open Depot, and promoting tourism? EDITOR NOTE–You obviously were not on a bicycle! With this latest little escapade by G-BAD, I have officially left the ranks of the conservatives and slid so easily into the camp of anarchy. Just burn it down and start over! I am not against growth, as long as it is planned, organized growth.This blatant disregard of the citizens wishes has GOT to stop! Ken,Ken,Ken! What on earth are you thinking? Posting “you have to spend money to make money” on this site. IF YOU HAVE MONEY, then be our guest (no pun intended) and build a conference center. The problem is as the GUARDIAN already stated you don’t HAVE the money. No one, apparently, who DOES have the money is willing to build the conference center. The GBAD boys don’t have the money either. So..if you need money to make money, what happens if you don’t have any? Hmmmmm, eating paper and crapping $50 bills is what I always thought my teenagers expected from us. Perhaps the GBAD boys are more talented than any of us think! You are right Ken, I would like to build a fence. However, I realize that isn’t going to happen even though I was happy with the $$ I was making in the 70’s. My gripe is when the voters say no, our elected leaders don’t listen. If the voters are wrong let them see for themselves the error in their thinking. But until then NO means NO. I agree, GBAD must go. It is a tool of the pro-population-growth crowd, kind of like the Mayor’s Office and the City Council. We need to separate government from business, at all levels of government. That is just as important as separating government from religion. A large convention center is unique. A one off deal. Does anyone know of a city in which a private firm built the local convention center? And what if it’s done here and, god forbid, it’s successful? The company B and C might want one also. I can hear the complaints now, regarding the city issuing permits for yet another large CC. Like it or not, we live in a complex urban society. There must be public/private partnerships to get most large scale, one of a kind projects done. Please note, I’m not in favor of more taxes anymore than anyone else. I am in favor of a better Boise. As I said before, much of the gov’t spending problem is one of oversight. And oversight does not mean cutting off public spending completely. That would probably be a disaster. Here’s some good gossip…Last time this was a topic here, I called one of the GBAD board members and told him about the discussion in this forum. Not one of those board members made any effort to make a point in this forum. Maybe it’s just me, but I think that’s weird. The reason this plan was not supported by the people is that we do not want two convention centers blocks away from each other. The open lot between the current convention center and the proposed new convention center makes no sense. My understanding is that the GAB purchased this land from S-16 (Simplot),who still own the lot between the two convention centers and have plans to plop a big hotel right in the middle. This makes great economic sense for the private propety owners, but not for the city or the convention center. I hope the Guardian holds their feet to fire on this one. The wacky plan to build as you go is a diaster waiting to happen and you know who will pick up the bill – the taxpayers. Ken McDonald where might I ask did you come from? Here we believe if there was money in it a private invester would build it. One thing I hear so much that’s so stupid, is the notion that a government should be run like a business. Governments and businesses both use money, and there might be a few other similarities, but the purpose of a government is NOT to make money for the “owners”. See the 2nd paragraph of the Declaration of Independance for further clues as to the purpose of government. Doesn’t the city or the ccdc own and run all the parking garages? Won’t this garage as a first step compete with them or will GBAD just turn it over to the ccdc guys? Besides that ONLY ONE LEVEL of parking would never be enough!!! Sounds like a real dumb idea…..sounds like another dumb “hole in the ground” city agenda. I am insulted by Dr. Stephenson Youngerman’s presumption that we were swayed by an effective disinformation campaign. Like none of us are the great leaders that he and his group are and that we can so easily be fooled. “Thank you Doc for protecting me from myself…I am so in need of your leadership”. And in the next paragraph “…ever mindful of the pressing need…” Where is the proof of this oh great leader. EDITOR NOTE–If memory serves, legislation was passed many years ago which allowed the G-BAD to transfer funds to the Boise Visitor and Convention Bureau for use promoting tourism. That is why the GUARDIAN made the suggestion of using G-BAD money for decent signs for visitor directions.